Fish City Albany has a full marine workshop. We’re out there on the water ourselves and know how to set your boat up and make it safe. Fish City Albany is a Mercury, Mercruiser Authorised dealer, our technicians specialise in servicing all major brands including Yamaha, Honda, Evinrude, Suzuki, and Johnson. Engine & Boat Repairs, Rebuilds & Maintenance. Installing the latest gear, from Outboards to Electronics and Chandlery. Service reminders, don’t get caught out again! Fish City Albany holds a considerable amount of parts in stock and if needed will order in any parts for your boat or motor. Tip: Preventative maintenance on your engine, hull or trailer is important and can save you in the long run, especially when storing your boat over long periods. Always flush your engine with fresh water after use. Make use of Saltaway to keep your engine water galleries clear. Use Quicksilver Corrosion Guard, Inox or a comparable product to keep the externals of your engine clean and clear of salt build-up. Fuel Stabilisers are a good idea as modern fuel contains alcohol which will attract moisture, leaving water in your fuel tank. This is the worst outcome for any engine, potentially causing a multitude of expensive damages. Water separating fuel filters will assist in removing water from the fuel, they are easily fitted to most boats and provide an inexpensive remedy. Storage Seal spray will protect the engine internally when left for long periods. Grease points, but DON’T use automotive grease, use good quality marine grease. Batteries should be charged before and during storage to keep them in good condition. Regular servicing of your engine every 12 months or 100 hours will make it more reliable and keep you and your family safe. Always adhere to the Manufacturer’s Warranty conditions. 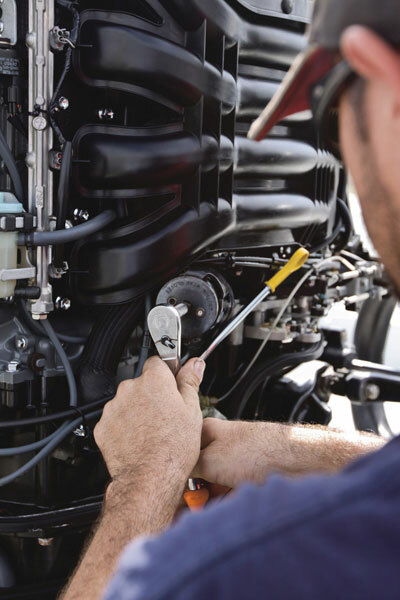 Steering systems are an important part of the engine-servicing schedule and should be checked annually by an authorised or qualified marine dealer for safety reasons. Flush your trailer after use with Saltaway. Fish City Albany are Sensabrake agents for North Island. Beware of sinkers or hooks etc under-floor. Dissimilar metals cause corrosion to the hull, creating holes from the inside out. Remove carpets so they can dry out, fill the boat up to floor level with fresh water regularly and allow to drain and dry.